Vancouver, British Columbia, Canada – HAWKEYE Gold & Diamond Inc. (the “Company” or “HAWKEYE”) (TSX.V-HAWK; Frankfurt Ticker: HGT; WKN: A12A61 ISIN: CA42016R3027): is pleased to announce that the Company has completed its phase two work program at the Boomerang Property, located in the Golden Triangle of northwest British Columbia. 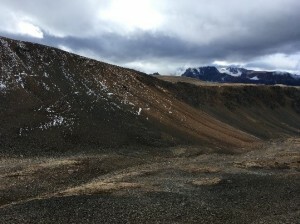 The Boomerang property is located 28 kilometres northwest of Teck’s Schaft Creek deposit and 50 kilometres north of Teck and Newmont’s Galore Creek deposit. The Boomerang work program involved prospecting and geochemical sampling, with a total of 30 rock samples and 252 soil samples collected. 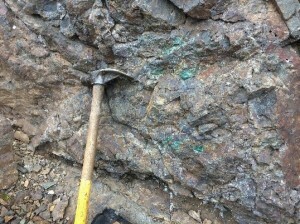 Left: Chalcopyrite and malachite mineralized basalt, associated with syenite dykes (view approximately 1.5 m x 1 m). Center: Boomerang property looking southwest. 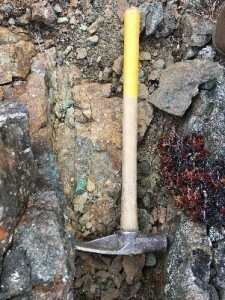 Right: Chalcopyrite and malachite mineralization within fracture (25 cm across at this place) hosted by intensely altered volcaniclastic rock; mineralized zone can be traced for over 20 m.
Technical information in this news release has been approved by Andrew Mitchell, B.Sc., P. Geo., a senior geologist with C.J. Greig & Associates and a qualified person for the purpose of National Instrument 43-101. Mr. Mitchell has prepared, reviewed and validated that the technical information contained within this release is accurate.